Which company demonstrates better earnings growth? 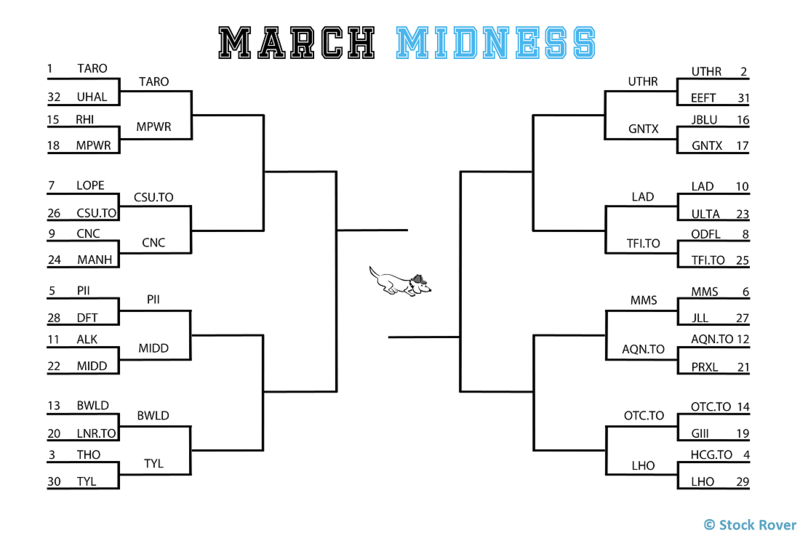 Welcome to the first round of our March Midness Mid Cap Stock Tournament! 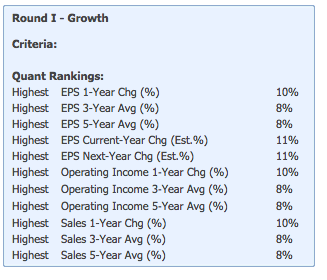 In this round, stocks compete in the category of earnings growth. Earnings growth is a critical element of a growth stock, and it is especially important in the mid cap context. This screener is available for you to download from the library, so you can apply it to your own lists of stocks (note the screener is Premium). Overall, the criteria are all close in weight, however 1-year and expected growth metrics are weighted slightly more heavily because we are hoping for accelerating growth. We’ll apply this scoring criteria to all 32 competing stocks, and then simply compare the scores for the two stocks in each match. The winner advances. Easy-peasy. If any matches are especially close, we’ll go to a tiebreaker. So how do our competitors stack up in terms of growth? Here are the full results of the Round I Growth screener scoring. In addition to the relative rank of all stocks in the watchlist, I’ve included the columns for each of the weighted criteria so you can see exactly how each performs. Click on the image for a full-size view of the table. Note that while you can see each stock’s rank in the above table, their scores are only visible in mouseover tooltips in Stock Rover. United Therapeutics (UTHR), the highest ranking stock, had a quant score of 81.34, while the lowest ranking stock, Linamar Corporation (LNR.TO), had a quant score of 61.23. That means that even the lowest ranking stock is still demonstrating above average growth (scores are calculated using percentiles in the North American market context). The screener we used to find these stocks (available for you to download in the Stock Rover library) has apparently done a good job in finding growth stocks. 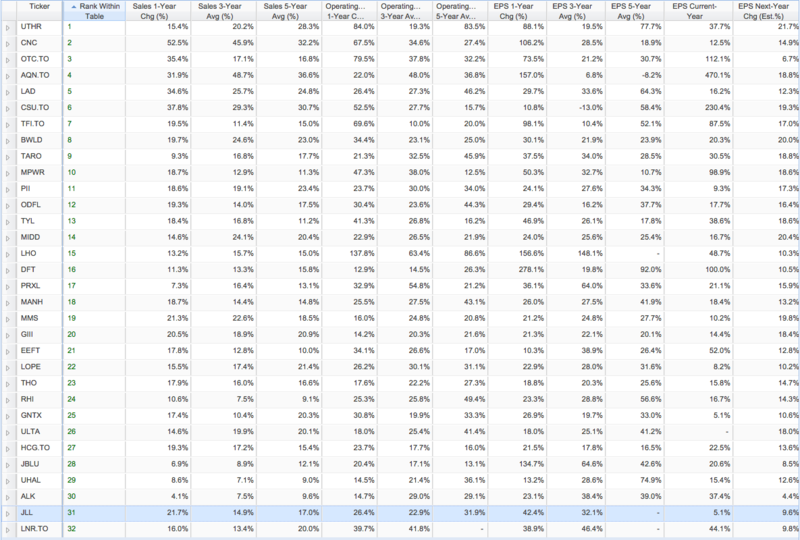 Most of the numbers in this table are strongly positive. The closest match, based on screener ranking score, was Polaris Industries (PII) versus Dupont Fabras Technology (DFT), which had scores of 73.36 and 72.66, respectively. As you can see from the the table, DFT has an incredibly fast growing EPS which clearly boosted its score. I examined this further and discovered that the stock has a huge jump in EPS in 2014 relative to 2013, from $0.31 to $1.19. Impressive, although this does provide some context—the exceptionally fast-paced growth is coming off a historically relatively low base for DFT. LaSalle Properties (LHO) and Algonquin Power (AQN.TO), which are both advancing to the next round, also post some triple-digit numbers on the board, but both also have relatively low base EPS numbers—especially AQN.TO, whose EPS of $0.22 is the lowest among all competing stocks. A fluke? We’ll see if this utilities stock can cut it in the financial strength round. Note that the numbers shown in the above bracket represent the original tournament seeding, not the scores from this round. Tune in next week to see who has the most financial strength!